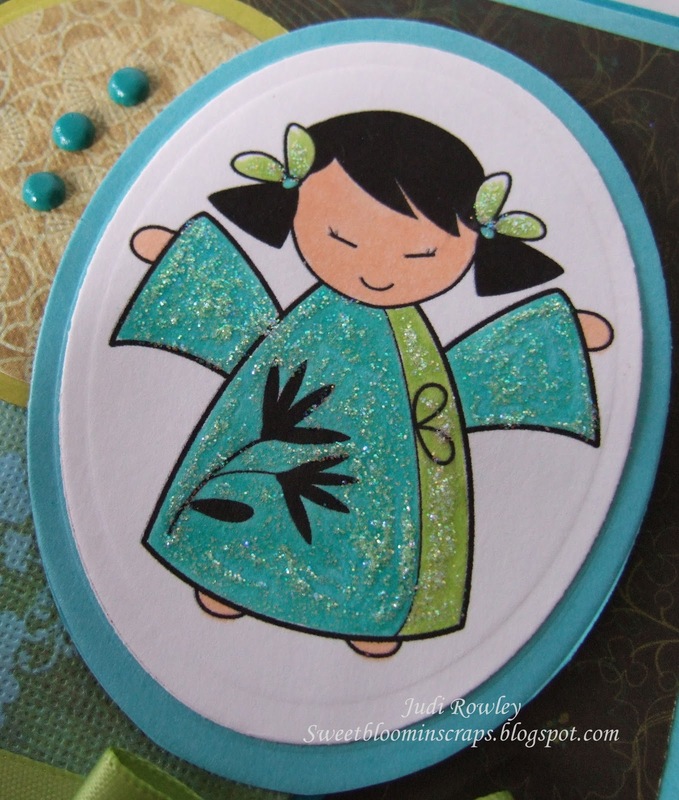 Oh, how I love Sally Ann's Cute Oriental Characters. This image is called Kishi. It reminded me of my granddaughter and thought I would make her birthday card with this image. I'm a few months early but that is ok. It will be waiting for her when the time comes. This card almost took me back to Okinawa. Digi Stamp Boutique is our fabulous sponsor this week at SSW! Sally Ann is offering 6 free digi images of your choice if you are our lucky weekly winner at SSW! So stop by SSW and play along. Sally Ann is constantly creating new images for your delight. You will love all of her creations. Just to remind you that we only have a few more week's until our 100th Sketch Celebration. So be sure to check back offen. 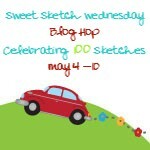 We will be having a blog hop and lots of prizes. Thanks so much for stopping by and have a wonderful Easter week! So pretty! I love the papers you chose - I just love the silvery blue one. And such a cute little bow - Love it all!!! I LOVE this card Judi!!! That little Kishi is adorable in her sparkly kimono! It's the colors you used that really grabbed my attention, they're fabulous!!! Have a very Happy Easter. Judi, I think this is one of my favorites that you have made. You can tell you made this one with alot of love for your little grand-daughter. Kishi is just adorable. I love the added texture and sparkle you have added to her kimono. The papers and colors are so perfect. awww, what a precious card Judi! She is just so pretty as are your beautiful papers!! Love the pretty colors and the added sparkle to her outfit! Have a super week and a wonderful Easter. Hi Judi your card is so lovely and such a cute image I do love Kishi. My great niece in Japan is one third Kiwi, one third Brazilian and one third Japanese and very cute. I just adore your colours used on this card really lovely. Wishing you a wonderful Easter Weekend with you family. Beautiful card, Judy!! I love the color combination! another beautiful card, love the japanese look! She is so sweet and I love all of the glitter you added. Your granddaughter is going to love it! Judi this is a fabulous card! 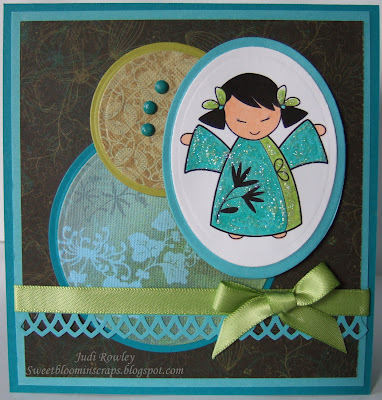 You've selected the most perfect, Asian-inspired papers that are terrific with this darling image. I love that glitter you've added to her kimono and these colors together too. Wishing you a wonderful Easter. It's a wonderful card. I love this Kishi and papers. Very good idea to use glitter to her kimono.